A year ago, I refused to sign a gas lease. I didn’t want anyone walking on, driving on, drilling on, piping on, being on…you get the picture! And, at $100 an acre, my husband humored me. Now, money calls out a whole lot louder. “We can’t stop the drilling all around us, so we might as well sign,” my husband says, as he nudges me a little bit harder. We can sign a lease with a no-surface rights clause – drill horizontally under us, but don’t tread on me! It solves the “not on my land!” problem, but I’m still losing sleep thinking about the bigger picture. Pay as little as possible to the landowners. Don’t advise people about the sure-to-happen-soon price run-up. Offer contracts with legal protections only favoring the company. Don’t advise the landowners to seek legal help before signing. Like it or not, these actions are typical and legal business strategies. So, keep in mind: the gas companies, with their big bucks and heavy political clout, will always approach the Marcellus strictly as a business. Just because they act legally, does not mean that they will act in the best interests of landowners or others who live in our communities. We must be vigilant and vocal in our call for responsible drilling. Consider just two causes for concern: the impact of well spacing and surface damage due to drilling sites. Landsmen from two companies spun the same story to me: “Horizontal drilling means that wells can be further apart than vertical wells. There could be one well drilled per square mile or per 640 acres.” What they hadn’t answered yet is my question about why Marcellus will be different than the horizontal drilling taking place in the Barnett Shale in Texas. Even horizontal drilling with fracing can not capture enough of the gas in shale, so companies are increasing their recovery in the Barnett by infill drilling their horizontal wells (drilling in between existing wells) with spacing as close as one well per 20 acres. Let me repeat that…as close as one well per 20 acres! Apparently, Pennsylvania has lax rules on well spacing (please leave a comment if you have specifics). Will we see dense drilling in the Marcellus? Probably. How dense? I don’t know, but it’s an issue that should be discussed and researched by everyone living in the Marcellus play, landowner or not. What about surface damage at the well sites? Horizontal wells require approximately four acres of land (versus 1 ½ for vertical wells) for the drilling pad, storage pit, equipment, etc. Each pad must be placed on a level surface, so excavation of hillsides is inevitable; especially as well spacing becomes denser. Add to that the access roads carved into the land to every drill site and the miles of pipelines. And, although companies are supposed to return drilling areas to a similar state as before drilling began, if Marcellus follows Barnett’s lead, many wells will be refraced several times over their lifetime. Surface destruction will happen more than once at each site. My scenario may be the extreme, but even with regulations, gas companies in other states have easily received variances to allow them to reduce well spacing. Remember: the gas companies will be focused on recovering billions in lease investments and on maximizing their future profits. They won’t walk away from profitable gas extraction just because you don’t want to see a wellhead out every window. If you haven’t signed a lease yet, consider this issue. If you have signed, think about it the next time you negotiate. If you don’t own land, realize that this gas play impacts you too. I mentioned my concerns to someone else last week and felt my stomach churn with his reply. “I don’t care if they ruin this area,” he said. “I’ll just take my royalty checks and move somewhere else.” He left me momentarily speechless and deeply discouraged. 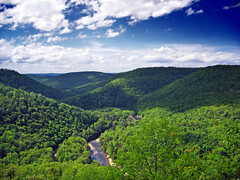 Later, I reminded myself that many others also love the beautiful Appalachian Mountains region of Pennsylvania. Our challenge? To find a balance between our newfound prosperity and the natural surroundings that enrich our small-town and quiet country lives. Yeah, unfortunately, there may be long-term negative consequences no matter how carefully the contracts are drafted.